You will find here Titanium composition, Titanium properties, Titanium density, Titanium melting point, Titanium welding procedure, Titanium equivalent, Titanium uns, Titanium corrosion, Titanium temperature range, Titanium machinability, Titanium price, Titanium specification, Titanium physical properties, Titanium resistivity, titanium material maximum allowable stress, titanium material magnetic properties, titanium material maximum temperature, titanium material weldability, titanium material weight calculator, titanium material designation, titanium material corrosion resistance in seawater, titanium material allowable stress, titanium material annealing temperature, titanium material brinell hardness, Titanium heat resistance, Titanium fatigue properties and lots more. Our super special steel products including Titanium are suitable for Plant manufacturing, Machine engineering, Power generation and Powerplant etc. 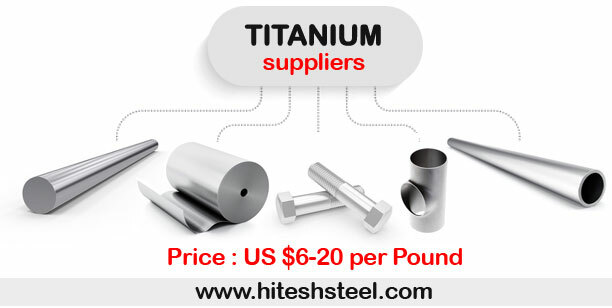 We are supplying best quality Titanium to our clients globally. As a stockiest of Titanium Materials, we have been successfully catering for the needs of the Oil & Gas, Aerospace, Nuclear Power industry in USA, UK, Canada , Australia, Israel, China, Russia, Sweden, Netherlands, France, Germany, Italy, Singapore, South Korea, Malaysia, Turkey, Indonesia, Mexico, Spain and Saudi Arabia etc.